Goosegrass (Eleusine indica) is a monocot weed in the Poaceae family. In Brazil this weed first evolved resistance to Group G/9 herbicides in 2016 and infests Corn (maize), Soybean, and Wheat. Group G/9 herbicides are known as EPSP synthase inhibitors (Inhibition of EPSP synthase). Research has shown that these particular biotypes are resistant to glyphosate and they may be cross-resistant to other Group G/9 herbicides. 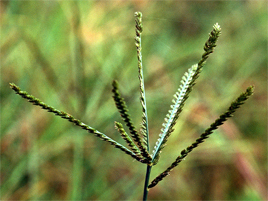 The Goosegrass populations from Brazil survived and reproduced at a lethal dose to the wild type. There are other Eleusine indica (Goosegrass) populations resistant to glyphosate around the world in countries such as US, Argentina, Malaysia, China, Philippines, Japan and Colombia. University of Maringá has been working with 25 populations of goosegrass from states of Paraná (PR) and Mato Grosso do Sul (MS) for the last two years (2014 and 2015). The “X rate”of glyphosate = 960 g ae ha-1 showed poor performance. Dose/response curves were conducted with doses of 0, 60, 120, 240, 480, 960, 1620, 3240 and 7480 g ae ha-1 and 90% of control was achieved only with > 1620 g ae ha-1. The level of resistance was: 2 to 8 fold (Table 1 and Figure 1). In a second study of dose/response curve, we used different rates (720, 960, 1200 and 1440 g ae ha-1) to detail the response. None of these doses provided 80% control. Shikimate lab assay: Significant differences on shikimate accumulation between R and S population (540 and 1440 g ae ha-1) (Figure 2). EPSPS mutation: Mutation in a Proline to a Serine at 106 position (Figure 3). Field, Greenhouse, and Laboratory trials comparing a known susceptible Goosegrass biotype with this Goosegrass biotype have been used to confirm resistance. For further information on the tests conducted please contact the local weed scientists that provided this information. There is no record of differences in fitness or competitiveness of these resistant biotypes when compared to that of normal susceptible biotypes. If you have any information pertaining to the fitness of Group G/9 resistant Goosegrass from Brazil please update the database. The Herbicide Resistance Action Committee, The Weed Science Society of America, and weed scientists in Brazil have been instrumental in providing you this information. Particular thanks is given to Jamil Constantin, Rubem Oliveira, and Hudson Takano for providing detailed information.